I walked about the same distance that I floated last week! (b) Areas where the surface waters will continue to support existing environmental, wildlife-habitat, and aesthetic purposes, as well as beneficial recreational uses. The USGS Hydrograph shows that over the past month Gunpowder River streamflows controlled by Baltimore City DPW have been much lower than the 11 year median. 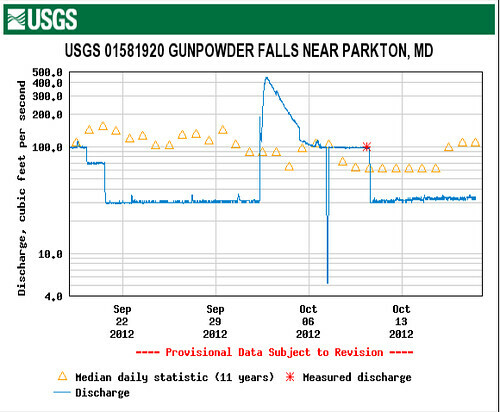 The Gunpowder River did experience a significant spillover event after a heavy rainfall event towards the end of September as noted on the hydrograph. The triangles show median discharge over the past 11 years. The asterix denotes a measured discharge. 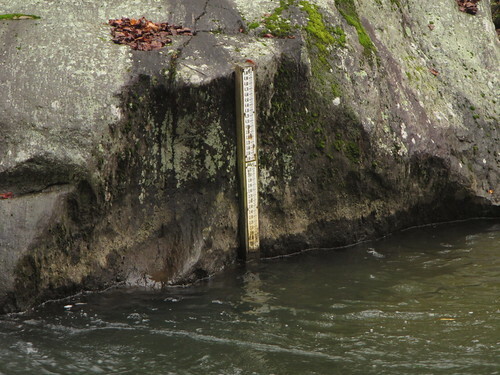 The blue line is actual discharge (or flow) through the gauge at Falls Rd. This entry was posted in news on October 18, 2012 by Theaux Le Gardeur.